The bulls are regaining a firm grasp on this market and the bears are being forced to cover in mass. I will look to add 1-2 new positions today. VIX – With many areas of headline risk melting away, the VIX indicator is struggling to maintain its recent bullishness. Yesterday it dropped 7.9% down to 15.25. 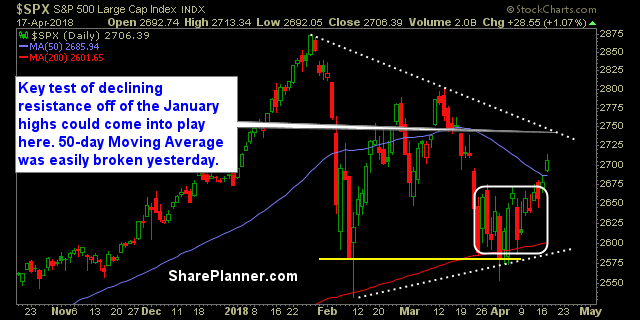 Look for a retest of the March lows. T2108 (% of stocks trading below their 40-day moving average): Another massive move by the bulls yesterday, taking the T2108 up another 11% to 61%. Right now it is as bullish as it was back in January when the market was running hot. Moving averages (SPX): All the major MA’s have been cleared, and that includes the 50-day MA that it gapped above yesterday. Technology taking back its place as the market leader with a huge move yesterday with a massive beat by Netflix (NFLX). Discretionary broke out yesterday and looks to retest its Feb/Mar highs. Financials continue to struggle and I’ve stayed away from them of late. The 50-day moving average was broken yesterday with ease, via a gap up at the market’s open, that was never relinquished. Declining resistance coming up on SPX off of the January highs. Expect it to be a major test for the bulls and whether it can sustain the current market rally.